Going to church has a way of reinforcing our feeling that God loves us. The praise and worship that takes you to His throne and you see yourself among the four and twenty elders, the ten thousand times ten thousand, and thousands of thousands of angels; the choir ministration that often seems specially chosen for you; the sermon that corrects, strengthens and uplifts you; indeed every part of service gives you the feeling of being wrapped up in God’s loving arms. Of course, you need to be in a living church where the true Gospel is preached and the ministers rely on the Holy Spirit, rather than on human knowledge and gimmicks, for this to happen. Thankfully, what happens to you when you worship under the flow of Holy Ghost anointing doesn’t end with the service. It stays with you: the divine coverage that brings supernatural protection, exemption, good health and provision. The whole atmosphere of His love and goodness persists ’cause in Him we live and move and have our being (Acts 17:28). A friend once said that going to church is enough warfare against the devil when you are under heavy attack. Refusing to give up and just showing up, no matter how battered you are, gives the enemy pause ’cause without your lifting a finger, there’s enough power when the saints come together to discomfit the powers of darkness and put them to flight. I learnt a song way back where it was paraphrased and I go with that every time. The body and the blood of our Saviour, Jesus Christ, which we partake of in the communion gives us His life and reminds us of the supreme price of love He paid for us: His death in our place on the cross of Calvary that we might live and be reconciled with His Father (Matthew 26:26-28; John 6:51,53-56). That’s where I’m coming from. 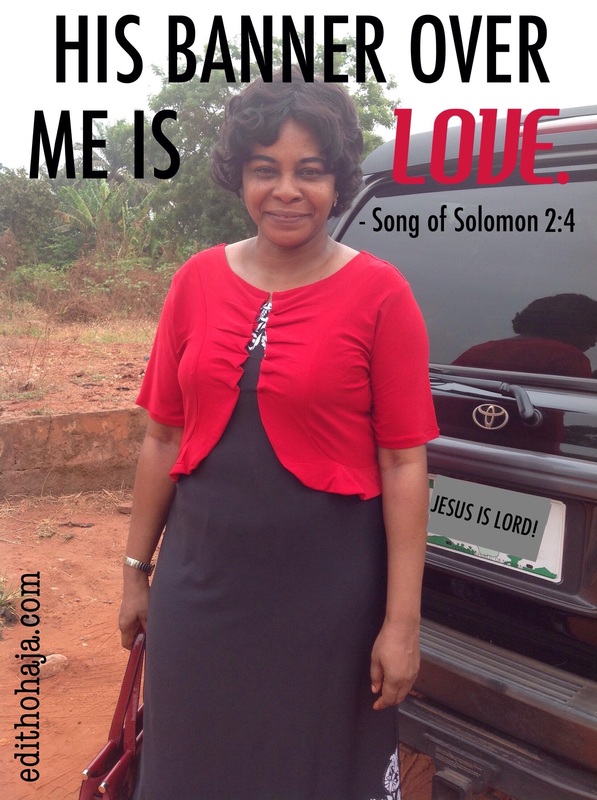 I’ve been to the banqueting hall of my Lord and HIS BANNER OVER ME IS LOVE! This article is really inspiring, there is this joy we derive when ever we are in communion with God. Recently I observed that it's only during exam period that sm student do go to church, but once they are done , they will return to dir normal ways. Its not meant to be so, we should always maintain that close contact with God no matter d situation whether good or bad and not wen we are in dire need of smtin. You're right, Nkemjika! We get the best out of our relationship with God when we actually love Him and don't use Him as a vending machine as my friend, Pamela Johnson, calls it. I concur ma! But this feeling is derived when the ministering vessels are connected to the Almighty. Then His presence fills the auditorium to the extent that a sinner is convicted, mourners receive beauty for ashes and the low in spirit are lifted. You're right, my dear! If the ministers are working by their intellect and not by the Spirit, people will be dozing in church and many will go back the way they came. Bless you, Uchechi! An Igbo adage says 'ayuko mamiri onu, ogba ufufu' loosely translated to mean, 'A combine effort at something is more effective'. There is also a saying that 'if you want to go fast, go alone. But if you want to far go together'. These wise sayings serve to further buttress the fact that in the heavenly race you need people to support you, and where else can you turn to for such support, if not the church? But its so sad seeing people running away from the church thee days, owing to different kinds of reasons. I earnestly hope things will change for the better in the nearest future. It has to if we desire to work together to take the Gospel round the globe before the Lord Jesus returns. Praise God and bless you, Flawlex! Praise God! Thank you, Patience, and remain blessed! Glory to God and blessings to you, Iheanyi! Fantastic exposition. we are loved by the ultimate being, we received love through the sacrifices of His Son and this love is shared abroad in our hearts. This experience may not necessarily be dependent on how religious we are in keeping to laws but,"it is that which is". Tht is, it is a universal experience that all must come to agree that we are loved and this love covers us and is even the basis of the totality of our being. I believe in this love and I experience and work in this love and I am a testimony of this love. I recommend this love, by this I mean that everybody reading this should strive to get to the level where there is an undoubting expression of this love in your heart. Oga Philosopher, thank you! Personally, I preach repentance from sins and acceptance of Jesus as Lord and Saviour as the proper response to that love. Truly, God loves us all, and He never misses an opportunity to show His love to us. But how have we acknowledged this love? A very important question for us all to answer. By impediment you mean attacks? Amen to that. We should never take our meeting together with our church family for granted. It is a special time for us to grow, and for each of us to be a part of the growth of the body of Christ. Indeed it is. "I was glad when they said to me, 'Let us go into the house of the Lord.'" Thank you very much, Kathleen. Showers of blessings on you and your family in Jesus' name. Thank you, my dear. Our God is good all the time. Thank you too, Nneoma, and remain blessed! What have we done to merit such love? What, indeed? That's why it's so amazing. You are highly blessed, Chikwado! Absolutely stunning in every sense, God's love for us has no measures as it is boundless. The question is, "why love us?" Well simply put, the answer remains, "because He loves us. " In describing God, love is one word that explains everything about Him. We merit not such love, only he simply loves us. When man submits to the will of God, in wholesome worship and communication, dedicating their lives for the purpose of living in unison with righness and peace with nature, such love assumes an even greater magnitude. If only man can exhibit if to say a fraction of God's love, then there will be no need for wars, no need for the gap between rich and poor, no prejudice, no embezelment of funds, no killings in the name of religion. If only...we would have been in one united earth. Your thoughts are profound. You are highly blessed, Ekene, in Jesus' name. Thats so true and also there is a need to understand the abundant and unconditional love of God to usward even when we were and are undeserving of it. Yeah that's true going to church helps us understand better that God loves us and his will for us is good not evil. You're right, Emmanuel! God bless you much, much in Jesus' name. I pray so, my dear, and bless you too in Jesus' name. In d presence of God dere is fulness of job. he deserves all d praise. His banner over us is love! I love that song from solomon. God has indeed listed us as under his banner. He has asked us to feast in the presence of our enemies! What great love. Inspiring post Edith! Thanks for sharing this. And thank your for your visit, Olu! His love is ever with us, so we can't stop talking about it. You are so blessed in Jesus' name. God's love for us is very strong.. May God strengthen us in His love. We have to learn how to take out time for God and go to chuch. There is never any disadvantage about it. Nothing but Blessings Blessings Blessings. I love this post. Am always excited when am praising and worshiping God especially in the gathering of God's people. I totally agree with you. nice work, ma. Remaining in the congregation of believers is no doubt very essential. Nice piece ma. His banner over us is love: the banner that ever shields and protects us, that covers us in the cold. Only His unending love could ever be such a banner over us. It's saddening to see that most people only go to church when they face challenges. It shouldn't be so. The church is the house of God and hearing the word of God edifies u. But we should also be wary of the kind of churches we go to. Bless u ma for this post. This is so true. His banner over us is love, his ever steadfast love. I don't think going to church here only means to always run to the church as a church goer. We are to worship God with our heart and love him as well. Through the hearing of the word of God, reading the Scriptures and praying fervently, we tighten or affirm our love for God. Thank you ma. the gathering of Gods people should not be neglected. Weldone Ma. What can we do on earth without God's unfailing love? Nice piece, ma. Glory be to his name,bnow and forever. amen. it feels good to be in God's presence for you will never come out as you entered. your mind and soul would be filled with gladness and joy and a feeling of rejuvenation will overwhelm you. God loves me. Thank You Ma for reminding me once more. Without the love of God there's no reason for living. And true love for God makes one surrender everything. Hence going to church is actually a basic way to show love for God. Beyond this we ought welcome Him to the slightest affairs of our lives. His banner over us is love,yes I strongly believe that. There is nothing more pleasing than dwelling in the presence of God. For me,going to church reassures me that God loves me and I don't think I will ever stop going to church. Thank you for sharing. I will not stop attending service because it has a way of waking me from slumber. Going to church is one of the things that makes us Christians. Being in the house of God gives one inner peace. There, we meet people that believe in what we believe in, people we can relate with. We have got nothing to loose and so many things to gain by going to church. His banner over me is love, his love for us is not to be compared, he is a merciful God, let us be faithful and be willing to serve and worship him all the time and wherever we are,, he loves us. Indeed whenever I heard about this phrase I always imagine creation activities of genesis it was out of love, he created man in his own image and likeness. I totally agree with you that going to church has a way of reinforcing our feeling that God loves us. Today fake prophet everywhere but I believe the scripture that the gate of hell will never prevail his church. By receiving communion one is completely in union with his creator provided he obey his commands, otherwise he receives death and the wrath of God. This love of God we are expected to show them to our fellow man. His banner over us is Love. we ought not to forsake the gathering of the brethren. This post reminds me of the love of God that surpasses our understanding, we are to just revel in it. good job ma! When God has chosen to call you his own everything about you changes, every move you make and indeed your entire life is planned by God. God uses unexpected circumstances to prove his love for you. Nice one ma! Today we have an even better promise: To know the love of Christ, which passeth knowledge, that ye might be filled with all the fullness of God. Now unto him that is able to do exceeding abundantly above all that we ask or think, according to the power that worketh in us (Ephesians 3:19-20).Here is Gods love promise to us, he has brought us in to his banqueting hall his banner over us is love God bless you ma. Going to church is very important to every human being both young and old.It is very very important to GOD that was the reason he gave it to us and told us to keep that day holy for him in HIS commandment. Worshiping him God either through praises or prayer helps alot. Yes he knows our heart desire, it is still good when we tell him through prayer or worship. GOD'S love is the overall, with his love am blessed. am clothed, am favoured, am covered, I have no fear. HE is a loving FATHER but we should not take his love for granted. Going to church is just one christian duty every christian should try and fufill because it helps in building us spiritually. Many have thought it wise that once you attend church service, you are redeemed and your sins forgiven. This is very wrong. It is our heart towards communion with the Spirit that saves us. His banner over us is love but that can only be actualized if we reciprocate it. You know, I used to think I'm the only one who felt that way. Most times I'd stepped into church with burdens in my heart and questions that need answers,but I never for a day left the same way I walked in. Most times my questions are answered from the pulpit without asking and my burdens rolled away. Indeed His banner over us is love. Thank you ma. Act of love, he redeemed us. No one is like him. May I ask ma; how can you know a living Church where the true gospel is preached? In all angles God loves us and He never misses an opportunity to exhibit His love to us. But how do we view and practice this love? Religion is a very powerful tool which strengthens us against the ordeals of this realm which we live in. Some people disband religion saying it is false and that it subjects people to a particular way of life. But religion is what keeps us sane, what creates order, what gives hope and what illuminates the faint light within us never to give up but to forever fight on. Religion is love and love overcomes all. In the presence of God there is joy and fulfilment. Fellowship, together with others, is a way of relieving one of stress and troubles of life. True talk, going to church does great miracles in ones life, at times when i don't receive the body of Christ (communion) i feel something in me isn't complete. But, in this country of ours now going to church has become a tradition where people just go because its a Sunday and majority don't regard the service as a tool to fight the devil. nice one ma, i hope student like myself learn from this. The best thing humans can do is always be in God's presence. The Bible made it clear that Christians should not forsake the assembly of the brethren. Indeed there is this joy that comes when we are in the midst of our fellow Christians and in God's presence. Thanks, Aunty Edith, for this reminder of God's love.